Peter Olson is a retired Swede, living in Paris since 1974. Great blog! I love it! Wonderful photos, explanations, information, details. Very rich and complete. Many many interesting topics: architecture, arts, music, history, nature, society and so on. It's a daily pleasure reading it. I found PeterÂ´s blog very interesting because he shows us great pictures with good texts. Paris is very beatiful if you it see with the PeterÂ´s eyes. The postings to this blog are frequent and interesting. Some postings deal with the well known while others deal with more unfamiliar aspects of Paris with which only a long time resident and lover of Paris would be acquainted. Well written and researched always. Peter's Paris blog is always interesting. Thorough research, lovely photos, great personality. My favourite Paris blog. The most attractive things of Peter's blog is his great combination of text & photos. Every time I read, it seems I am also travelling with peter & enjoying those beauties of Paris with my eyes. I've been reading for quite some time. It often brings tears to my eyes as I recall places I have been, or sights I want to see. Merci, Peter! I've been following book blogs for the last few months and wanting to send Peter an e-mail. I couldn't find the words! It is an unbelievably beautiful and thoughtful blog. I lived in Germany (USArmy) and traveled to Paris at every opportunity. I'm an out and out Francophile and Peter's blog starts my day on a happy note. Peter's blog is the best blog about Paris I've seen! His photos and commentary are unequaled! Peter's Paris is exceptional. His photographs coupled with the most interesting text and history make this blog one of my favorites. My trip to Paris is always rejuvenated in my mind when I experience his creativity in bringing "The City of Light" to life. Great sites, great topics, great pictures, clear and thoughtful descriptions. En tant que Parisienne de naissance, de coeur et d'Ã¢me et Ã©tant une expat moi-mÃªme, , je me rÃ©gale Ã aller sur le blog de Peter pour me remÃ©morer mon enfance et ma jeunesse et aussi pour m'instruire et dÃ©couvrir les coins de ma ville que je connais point. Always interesting with a good history of the subject accompanied by many photographs giving the viewer a better understanding and knowledge of the City of Light. Excellent pics always, takes me back to the beautiful sights I have seen there. I enjoy exploring Paris through Peter's eyes very much, and I've used his walks and introductions to areas as useful tips during my own visits. It helps to make a big beautiful city more approachable for a visitor who doesn't want to stick to the well-trodden tourist track. His photos are lovely on their own, but he adds so much more with the maps and commentary on art, history, culture etc. Tack snÃ¤lla Peter! This is the next best thing to staying in Paris. I have learnt so much about the City and I thought I knew it well!!! Peter's description brings the city alive. Peter's blog is a delight! I learn so much from it and the gorgeous photos are amazing. He knows Paris so well and does a lot of research trying to enlighten us on different artists, architecture, history... "Peter's Paris" has been a favorite of mine for few years now and I am never disappointed. 1 blog plaisant et sans polÃ©mique sur le Paris qu'on aime! I love Peter's blog. He so makes me wish I were in Paris. I have used his blog many times for in-depth looks around Paris. Someday I hope to make his acquaintance! And thank you for not publishing negative comments. Who has time for that?? Peter's blog is one of the best I've come across, for he goes to extraordinary lengths to research and communicated details of Paris, and elsewhere, that we would have a hard time finding without his excellent assistance. And if you ever have the chance to meet Peter and walk with him through the streets of Paris, don't miss it, he is a great guide, and a great guy ! Excellent guide with perfect comments giving you ideas for revisiting aereas in Paris you haven't visited for a certain time. Want to explore Paris even more, after reading this blog. Love all the details! Great and interesting blog! The only chance to vist Paris when there is no chance for travelling. It's a pleasure to follow Peter through Paris. Thanks a lot! Love Peter's blog. His photos are beautiful. The maps really help you to know where things are located and the history and information is fascinating and informative! Love all the information and photos on this blog. When I'm feeling down this is the blog I go to. A go-to blog for great descriptions of the places I hope to visit in Paris. Introduced in October, by Peter, to the Salpetriere! Excellent post. Love your photos, the well developed history lessons, the charming spots you pick. thank you for the vacation i can take while just sitting with my machine and a cafe au lait. bravo. Hope your surgery goes well. I always look forward to seeing Peter's blog because he has great photos and does such wonderful research for each post. 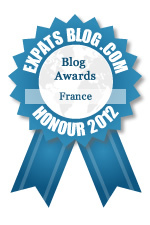 He is very generous to share his wealth of knowledge about Paris with us through his blog, and I say YES his blog has what it takes to win the Expats in France Award! Excellent and informative with a unique point of view. BRAVO! Peter has a great blog and he takes stunning pictures. I love how informative he is about Paris, it almost makes me feel as if I'm there too! I love that this blog, Peter's Paris, is not gimmicky, does not try to be sarcastic, nor is it cloyingly sweet or romantic, and most importantly it does not try to be a guide book to the city. It is a perfect glimpse of Paris, giving the reader a chance to explore the city without necessarily being there, it is objective with a human touch.